Perfect side Greenhouse to lean onto walls, garden wall, garage or shed. The greenhouse is made of anodized aluminium profiles and heat-insulating hollow wall sheets andcan be efficiently fitted onto every wall. The folding, practical roof window ensuresa good airflow. The gutter directs the rain to the sideof the greenhouse. So you can directly collect the rain water and use it. 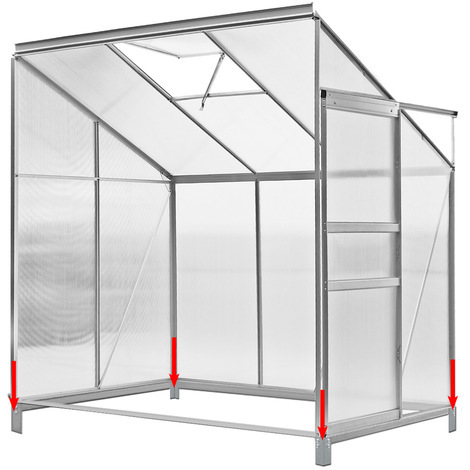 The foundation made of galvanized steel provides additionalstability in your greenhouse. With the foundation, the greenhouse isstable and at right angles. The foundation prevents from sinking onsoft or soaked ground and offers the best opportunity of ground anchoring. Assembly: the frame is fastened at the ground with metalhooks. The greenhouse and the frame are firmly connected together withbrackets and screws.